In 2017, another well above normal snowpack winter and heavy spring rains resulted in 23 new landslides, which damaged or threatened WYDOT roads. WYDOT turned to GSI to help respond to these emergency situations. GSI was able to respond very quickly and in most cases had personnel on site to assess the site within 24 hours. They would provide a proposal for remediation with a preliminary design and estimated costs within 48 hours in most cases. During 2017, GSI was selected to perform remediation with contracts at six separate sites. In all cases, they were prepared to mobilize to the sites and begin work within a week of being given notice to proceed. A unique element of these emergency contracts was a partnership, between WYDOT and GSI, by which WYDOT provided some logistical support such as traffic control and providing water for drilling operations so that GSI could focus its efforts on performing the specialty work. This arrangement resulted in cost effective, efficient, successful projects. When responding to emergency landslide repair, time truly is money, the sooner a landslide can be remediated before it has a chance to grow, the less expensive it is to repair. In the past, WYDOT has experienced situations in which, landslides could possibly have been remediated quicker, experienced further failure during drawn out conventional design and contracting methods resulting in higher costs due to the additional failure. GSI uses various types of innovative geo-technology in their landslide remediation projects…. All of these projects were completed on schedule, even with cold weather conditions and snow storms …. 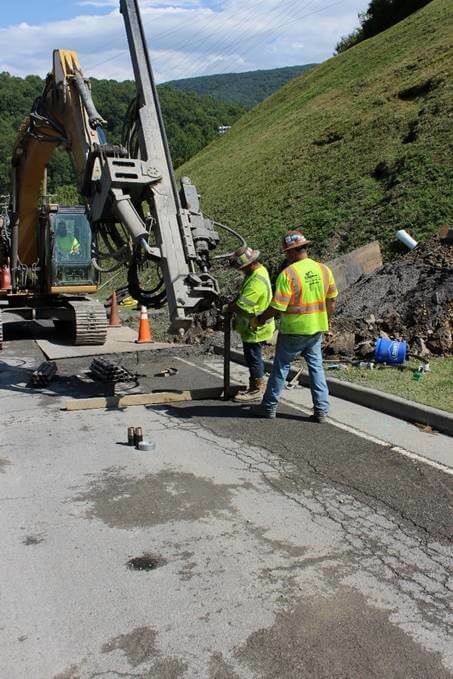 All of the stabilization projects that GSI completed for WYDOT included a warranty to repair any of the remediation that would happen to fail, but to date none of the work that they have performed has required any repair. I would highly recommend GeoStabilization International to perform emergency landslide and slope remediation work. They have the resources, personnel, and expertise to respond to your emergency in a timely, professional manner.